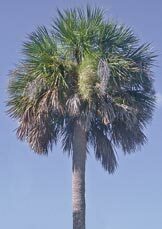 » Save our State Tree: Stop the Sabal Palm Massacre! Over the past 25-30 years, a harmful, unnecessary and wasteful landscape practice has become widespread: trimming Sabal Palms. Sabal Palm fronds do not need to be trimmed unless their fronds are interfering with foot traffic, power lines or building maintenance. The fronds drop when ready and brown fronds are valuable to the environment. Thirty plus years ago, no one did this. Someone came up with this practice as another way to make money off ignorant property owners. The practice has taken off all over the state, to the detriment of our palms. Save money, save your palms, and just say no to palm pruning. This is the way our Sabal Palm should look – with a nice rounded crown, all of its fronds including green and brown, and flower stalks in tact. The particular palm lacks boots, but if your palm has boots, rejoice and plant vines in them. Boots are good and need not be removed. They may drop off naturally as the palm ages. Drive around Charleston, South Carolina, and observe how the wealthiest mansion owners proudly display their shaggy palmetto trees. Trimming our palms is a thoughtless trend that needs to end. Green fronds are the palm’s source of nutrients! Cutting green fronds stunts growth, invites disease, and reduces the palm’s natural resilience to high winds. Harsh pruning takes away food and shelter from native and migratory songbirds, woodpeckers, butterflies, honey bees, treefrogs, bats, anoles, squirrels, and other wildlife. Over-pruned palms may develop weakened trunks, which can eventually cause them to break off and die. Work boots with climbing spikes incur wounds in the trunk, leaving the palm prone to disease. Palm fronds, berries, and boots: Brown fronds provide unique habitat for tree frogs and bats (chemical-free mosquito control). In nature, there is no waste. Recycle fallen palm fronds as mulch or a brush pile for wildlife. Palm berries are critical sources of highly nutritious food for many birds and other wildlife. Plant palms where berries and sprouts won’t be a problem. Palm “boots” (the leafbases) are important habitat for other plants, including many beautiful rare and endangered ferns. Perhaps a better understanding of the palm’s use by other creatures will enable us to see black fruits, brown fronds, and boots on the trunks as things of great value, if not beauty. Sabal Palm Pruning Poster: Black & white, 11 x 17, “do not do this” message readable at a glance. Inexpensive & easy to print.